Why not be introduced to a band with an album containing b-sides, acoustic versions and covers? That was what happened when my attention was directed to the release of the latest of a band from Minneapolis called The Right Here. Songs wound down from the rock and roll the band usually plays or the acoustic version of things to come next year. My guess is that in the opening song, 'Buy Me A Round' The Right Here presents itself as its usual self. Straight forward rock in a familiar U.S. style. Oh so pleasant with all the right hints at spiced up country rock with a little punkrock on the side. A rough sounding singer to top things off. Just to make sure the fans recognise the band and invites them to join it into less perhaps even uncharted waters where amplification and effects are left behind. The covers are dead right and surprising. 'Dead Flowers' is the kind of country rock song that can do with a little sprucing up the way The Right Here does with it. The Stones never released the song as a single, but should have in 1971. It would have been a huge hit. A morbid sort of sing-a-long song. The version on Another Round brings out all the strong points in the song and adds to them. A great rendition. 'Modern Love' by David Bowie is more surprising as it is a totally different beast. I was truly curious what The Right Here could have made of that raucous stomper from Bowie's commercial heyday. A surprising volatile one actually. This band knows how to make interesting covers. Let's go back to the beginning. The album starts with the song that ends it acoustically. 'Buy Me A Round' is a rocker in the best Slobberbone tradition. Huge drums, a fierce bass and low slung, low singing guitars, nearly shouted vocals to top things off. This is just the kind of song I love this genre for. And this is a B-side? If that is the case I better familiarise myself with previous albums fast. Things do not really get better than 'Buy Me A Round', but then most of the rest of the album goes off in another direction, to another side of The Right Side. Armed with an acoustic guitar this band stands it ground also. 'When The Boys Come Around' is a beautiful song in a style faintly bringing the acoustic Neil Young to mind, the electric guitar mixed in the background growls at times, making it not hard for me to imagine how this song must sound like in its original version. 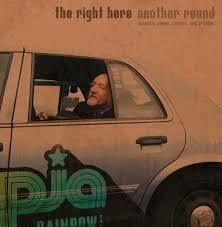 In its music The Right Here captures a lot of Americana rock of the past decades. The fun thing is that for me this band stays completely on the right side of this equation. In other words, it stays away from the Bruce Springsteen bombast I just can't listen to. A song like 'You Won't Miss Me When I'm Gone' plays with all the right emotions. The warm organ sound providing the exact right accents to the piano driven song. No guitar in sight here. Instruments no one seems to play, following the information in the link below. What I can't tell (yet) is whether Another Round is the ideal The Right Here album to get acquainted to the band. A few songs seem to be right on track, others are totally off track. So be it. I'll content myself with the conclusion that this was a great way to get introduced. Another Round is the kind of album that may not pop up in my top 10 of 2018 but surely will keep finding its way into my cd player and iPod over time. The power of a song like 'More Delusions' will take care of that. It's time to give my old Slobberbone cds a new spin as well.